Metal-framed windows and doors have plenty of pedigree – from the early use of lead to the graphic lines typical of modernist architecture. Houses built in the 1930s generally had steel windows, and they’re also a notable feature of Art Deco homes. They’re not consigned to the past, however, and are much sought after for today’s home renovations both as replacements for less stylish options, as well as for extension projects. Want to get the lowdown? It’s all here. Are you fitting metal windows as part of a renovation project? Find our how to renovate a house in our expert guide. Or, if you are extending, find out how to extend a house. Will metal-framed glazing suit my home? Metal-framed glazing is an elegant option that suits properties of different styles and will look great for years to come. Both metal-framed doors and windows can complement homes with brick exteriors as well as modern grey or white rendered walls. If your house currently has dated uPVC doors and windows, metal can be a much slimmer and more attractive alternative. Fitting metal in place of wood, on the other hand, can allow you to avoid the maintenance requirements of timber. Why choose metal framed doors and windows? Panel style metal-framed doors won’t offer the uninterrupted views that bi-fold or sliding doors do. However, they will frame views to the exterior in an appealing way. The metal framing isn’t bulky, so they’ll still let in plenty of light and each pane can reveal a new perspective. You might also like the idea of the doors themselves being a feature rather than a barely-there barrier, and they can complement other materials used in an interior scheme. And the style’s not just appropriate for doors: panelled metal windows can bring an industrial edge to your home, or create period style, depending on the dimensions of each of the glazed elements. Metal doors and windows don’t have to have the multiple glazing bar style, though. Consider more contemporary offerings that team expansive panes of glass with super-slim metal framing that maximises light and views. What colours do the frames come in? There’s an enormous choice of frame colours for metal windows, ranging from classic black, through greys to standout shades such as orange, red or green. Your supplier might also be able to colour match them – for example to a favourite paint shade. What are metal door and window frames made from? 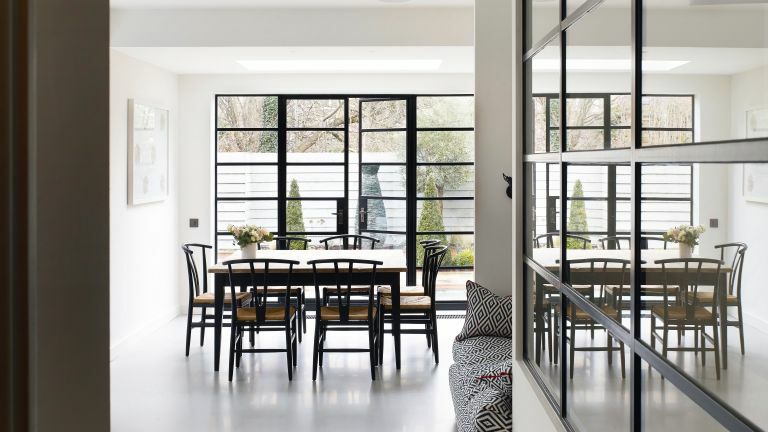 Crittall’s doors and windows – the designs that probably spring to mind when you’re thinking industrial-style glazing – are renowned and are made from steel. If you’re lucky enough to have a period property with original Crittall Windows, you can replicate the historic designs. Steel doors and windows can look just as good when they aren’t original to the property, though. Steel designs from other manufacturers are also available – for windows and doors and even roof lights. Metal doors and windows can also be manufactured using aluminium. This metal is strong and light, and will create frames without bulk. As well as designs that maximise light including both bi-fold and sliding doors, there are also versions that have the typical steel frame style, if that’s the look you prefer. Look out also for composite doors and windows. These low maintenance designs use metal on the outside and wood on the inside for a warmer effect internally, energy efficiency and durability. Metal windows do require some maintenance; find out how to repair and maintain metal window and door frames. Are metal framed doors and windows well insulated? Well-designed modern metal doors and windows include thermal breaks (aka thermal barriers). These insulators are part of the frame and prevent heat being conducted outside by the metal, which could create condensation and leave rooms cold. They will also stop the metal frames indoors from feeling cold in winter or hot in summer, both of which can affect a room's ambient temperature. Together with modern glazing, thermal breaks ensure doors and windows are energy efficient. Can you divide rooms with metal doors, too? Metal doors can be a brilliant solution inside a home, and using them internally in addition to exterior doors will give your decor a consistent look. Used within the interior, metal-framed doors and partitions let light through but create a measure of separation – try them if you like the idea of broken-plan rather than fully open-plan layouts. Using metal-framed glazing in a hallway can also be a sound strategy, allowing light from a front reception room into the passageway without losing the benefits of a separate entrance to your home. How much do metal framed doors and windows cost? Expect to pay from £2,640 to £3,120 per metre for glazed panelled doors to fit a standard door height. Looking for more window advice?